Iman Umeed Aur Mohabbat by Umera Ahmed Download or read online another beautiful Urdu romantic novel Iman Umeed Aur Mohabbat by Umera Ahmed (Faith, Hope and Love) and enjoy a distinguished Urdu story. Iman Umeed Aur Mohabbat novel is authored by Umera Ahmed, she is a very popular Urdu writer, short and long Urdu stories writer, screenwriter, drama script writer and one of the most famous Urdu novelist in Pakistan. Download or read online another beautiful Urdu romantic novel Iman Umeed Aur Mohabbat by Umera Ahmed (Faith, Hope and Love) and enjoy a distinguished Urdu story. Iman Umeed Aur Mohabbat novel is authored by Umera Ahmed, she is a very popular Urdu writer, short and long Urdu stories writer, screenwriter, drama script writer and one of the most famous Urdu novelist in Pakistan. Umera Ahmed's novels are not only read inside Pakistan but also in India and Bangladesh as well. Many Urdu dramas are also made on Umera's novels. Iman Umeed Aur Mohabbat novel is also dramatized by private TV channel in Pakistan. 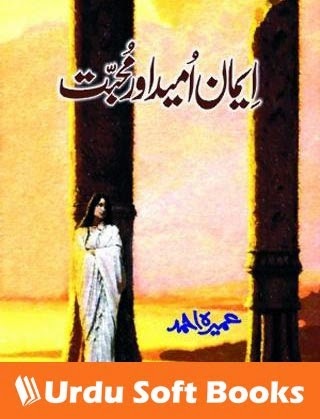 The Urdu novel Iman Umeed Aur Mohabbad is a masterpiece of Umera Ahmed, this Free PDF Book is one of the 10 most popular novels of Umera Ahmed.